DAYTONA BEACH, Fla. (AP) Dale Earnhardt was NASCAR’s ”Intimidator.” He stormed into the sport and won his first Cup championship in only his second full season. Earnhardt had achieved about all there was to do in NASCAR by 1998, including a record-tying seven Cup Series championships. 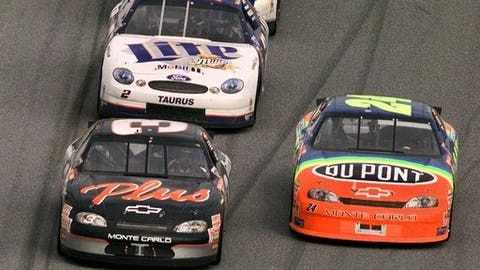 Winning the Daytona 500 was the only milestone that eluded Earnhardt over the first two decades of his career. He was a victim of bad luck, missed opportunities and close calls that stamped him 0 for 19 in NASCAR’s biggest race. He typically was among the few favorites to win Daytona International Speedway’s most prestigious event. Earnhardt had lost 14 times driving the famed No. 3 car for Richard Childress Racing, and both men desperately wanted to avoid more heartache. It all changed on Feb. 15, 1998. At 46, Earnhardt was the sentimental choice and, at last, won ”The Great American Race.” It’s a NASCAR moment that has stood the test of time. It included a lucky penny and a pit-road processional never before seen in auto racing. This is the story of that memorable day, told by men who lived it: his owner (Childress), his crew chief (Larry McReynolds), two fellow championship drivers (Jeff Gordon and Darrell Waltrip), and the race announcer (Mike Joy). Earnhardt had won 30 races at Daytona entering that day, so despite a 59-race winless streak in the Cup Series, he was the popular pick to end both streaks in the season opener. He won one of the twin qualifying races three days earlier. Childress: I think the biggest thing was Dale’s confidence going into that race. He was always confident racing here. But we all just felt like that was our day. … We knew we always had a shot. He was a man that could make up everything for us and he did that day. McReynolds: It just seemed like the deeper we got into Speedweeks, the better the car got. I think we finally reached the point that we really felt like the only team that could beat us is if we ended up doing something to beat ourselves. Gordon: As many times as it had gotten away from him, it didn’t seem to deter him from being just as motivated or more the next year. Waltrip: I won in `89, and it took me 17 tries. I knew what he was going through. I knew the anguish. I knew the disappointment. He wouldn’t let on a lot. He was one tough guy, `Yeah, well, no big deal. We’ll get them next year.’ That wasn’t really how he felt. I knew it had to absolutely tear him up every time something happened because he would get so close and then something would happen. Joy: They were not picked to win by everybody. But everyone felt like he would contend for the win, he would lead laps. And then everybody thought fate would intervene as it had 19 years in a row before. Earnhardt had a number of fluky failures in the Daytona 500. In 1997, with 10 laps to go and running near the front, he was involved in a late crash that sent his car flipping down on the backstretch. In 1993, Dale Jarrett passed him for the lead on the last lap. In 1991, he obliterated a seagull on the backstretch, damaging his radiator and forcing him to pit for repairs. In 1990, he cut a tire less than mile from the finish line, allowing Derrike Cope to steal one of his two career victories. Childress: Should have won a lot of those 498s, 499s. But it pays for 500. McReynolds: I think knowing the history and all the things that had bitten that 3 car with Dale driving it for the previous 19 Daytona 500s, you knew until you absolutely saw that checkered flag wave that race was not over, that it was not in the books, that it was not a done deal. Waltrip: It got down to the end of the race, I said, `Who’s leading?’ (Crew chief Jeff Hammond) said, `Dale.’ I said, `Well, he won’t win.’ He never had. Always something would happen, but this day he pulled it off. As Earnhardt crossed the finish line, the grandstands erupted in celebration. No one expected that emotion to carry onto pit road. As Earnhardt drove toward victory lane, crew members from nearly every team lined up to congratulate him. McReynolds: I did not even know until later that this receiving line on pit road had even formed to congratulate him. I thought what was really cool about that was even the 18 team of Bobby Labonte and Joe Gibbs Racing that had run second to us, they were even out there congratulating Dale. … At the end of the day, the entire industry, the other teams, everybody involved knew how much Dale really wanted to win this Daytona 500 and how much it meant to him, especially when you look at all the success he had had here and just never could close the book and seal the deal on the 500. Gordon: That was an awesome moment, unbelievable, unbelievable. The only way that happens – and I don’t know if we’ll ever see it again; I don’t think we will – is to be so close and be so good and to have some dramatic thing happen more than one time over a long period of time of somebody being so deserving and knowing how much it meant to them to get that kind of respect. Waltrip: I remember coming around off Turn 4 and all the cars are backed up on the track. I said to Hammond, `What’s going on anyway? How come we can’t get on pit road?’ He said, `Pit road is full of people and they’re all standing out there. Everybody is wanting to congratulate Dale.’ For a second, it kind of aggravated me. But then I thought, `How cool is that to have everybody line up and have him drive by and congratulate him on winning that race?’ Our sport is full of Dale moments, things that Dale did that we never forget … and that was one of those moments that we’ll never forget. Joy: That was the first time ever. When Tony Stewart ran the last race of his career and Jeff Gordon the last race before he retired and when Martin Truex won his championship at Homestead, we saw a similar outpouring of people lining up on pit road. But not to the magnitude of this. This was really special and unique. Earnhardt credited 6-year-old Wessa Miller for helping him get that elusive win. He met Miller through the Make-A-Wish Foundation following the final practice for the race. Miller gave Earnhardt the penny and told him she had rubbed it and that it would bring him good luck. As she handed it to him, he said he hoped so. McReynolds: The car gets back to the garage area and no Dale. … Finally, here he comes and he’s like a man on a mission. He walks by me like I wasn’t even standing there. I see him over in the tool box, digging through drawers. I said, Dale, `What are doing?’ He says, `I got something I’ve got to do.’ I knew he had something in his hand. He kept pulling drawers open. He finally found a tube of weather-strip adhesive like we glue the lug nuts on the wheels. I finally looked at him and he had glue running down his uniform. He had enough glue on this one penny to glue a dollar’s worth of pennies on the dash. I finally said, `Dale, I don’t know what you’re trying to do. Let me help you. I think you’re trying to glue this somewhere and then we can go to the hauler and talk about this engine.’ I still remember her name, Wessa Miller. Her wish was to come to Daytona and meet her hero, Dale Earnhardt Sr. We got the penny glued on the dash. Childress: The lucky penny the little girl gave him is still on the dash today. Twenty years later, the race still resonates throughout racing – partly because Earnhardt died three years later at the famed track but mostly because he came up short so many times before. There have been better races. There have been better finishes. But there’s arguably never been a better Daytona 500 moment. McReynolds: I don’t know if you could have scripted it any better. Childress: It will be talked about for many years. Waltrip: When an Earnhardt does something, it’s a big deal – whether it’s Junior or Senior. There have been a lot of incredible Daytona 500s, before that win and after that win. It’s certainly one that because of what Dale meant to the sport and what that race meant to Dale that gives that race a little bit more significance than maybe some of the others.